Pandesal is a popular breakfast food in the Philippines. 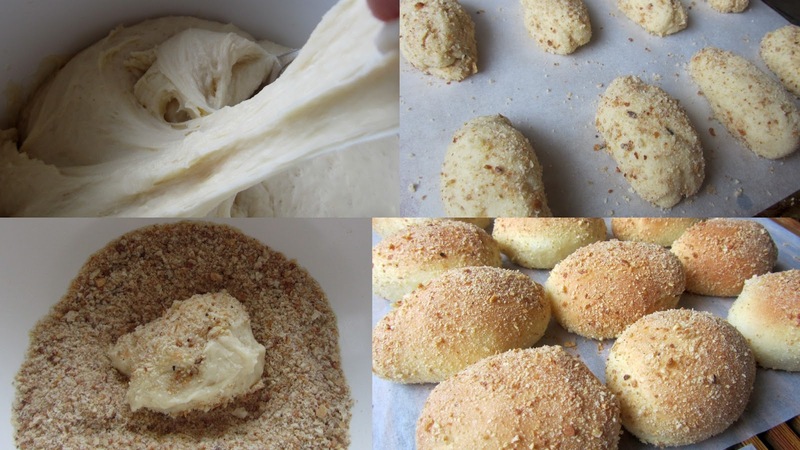 They are oblong formed buns which have been rolled in bread crumbs before baking. They are light and fluffy, crusty on the outside and soft on the inside. In the Philippines they are usually dunked in coffee but I prefer to eat them with cheese, jam, or a cream cheese spread. They are best hot out of the oven. Freeze leftovers, when reheated they are just as good. Our son has caregivers who are from the Philippines and they were telling me about these buns. I was intrigued so decided to give it a try and they turned out amazing. I have already made them twice in one week. I brought some to our son's home for the guys to try. I wasn't sure how they compared but they assured me that they were very good. Combine milk and water and heat in microwave till warm. Whisk in softened butter, sugar and egg. Add flour, salt, and yeast. Knead until all is well combined, I used the kneading hook on the mixer. The dough will be quite sticky. Pour bread crumbs into a bowl. Using a spoon scoop dough and drop into the bread crumbs. Roll ball of dough in the crumbs till coated, and shape into oblong buns. Place on parchment lined pans, cover with a tea towel and allow to rise until doubled in bulk. Bake in a 375º oven for 12 to 15 minutes until golden. My husband comes home from the Phillipines on Sunday...maybe I will make these for him as a suprise! They look delicious! I'm putting bread crumbs on my shopping list. I keep seasoned breadcrumbs in the pantry, but I think I need unseasoned for this. How do you suggest reheating them? Oven? I reheat them in the oven at 350º for a few minutes. These look amazing. I think I will make these to go with my chicken noodle soup I am cooking right now. Thanks for sharing. I followed the recipe exactly and they turned out exactly as illustrated. This is a very easy recipe for novice yeast bakers. They are fairly sweet, I made them today to use with Sloppy Joe's and they may be a tad sweet for this purpose but it made 14 so considering that there are only 2 of us we will no doubt enjoy this with jam and butter for breakfast for several days. I have tradesmen working in the house today and I have seen a couple of them sneaking peeks around the corner of the kitchen to see what smells so good! I'm happy they turned out well for you..thank you for letting us know.